How does the Instagram contest work? Entrants can participate the contest only once. Double entries are refused with an error message. On demand, you can also submit your own Instagram to the public vote. Feel free to contact us! Be careful, desktop visitors are able to check the gallery, they can also vote and participate. With the mobile it is only possible to participate with following operating systems: Android last version and iOS 7/8. The best solution to increase Instagram community engagement! The public choice: Ask the visitors to vote for the best entries. A visitor can vote only once for an entry, but for as many entries as he wants. If the contest is installed on Facebook, the entrants has to like the Fan Page and accept the application. Jury decision: You select a jury that picks the best content. Your contest gallery is still open for visitors, but they can not vote. Both of them: Your fans vote for their favourite entries. The jury picks afterwards a winner out of the most popular. 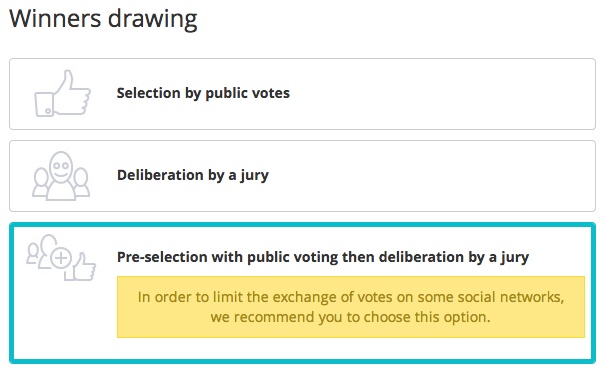 The platform does not provide this case in particular, but your jury can make his decision at the end of the contest by choosing one of the most voted entries. A page appears which shows all the entries (from the most popular to the less popular). Click on the entrants you want to choose as a winner. Open the winners tab and drag and drop the entrant on the gift you want to offer to him.